The Healthy Points Program is an optional program that provides our employees with tools, support, and resources to help improve and maintain health and well-being. For each completed wellness activity – listed on the activities sheet – employees will receive points. The more you do, the more points you earn.All employees can participate. To learn more about this program we have a page dedicated to the Healthy Points Program; click here for more information. TP Mechanical has many open positions on our careers page. 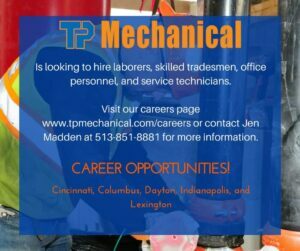 Please mention these openings to family and friends; those who are interested should contact Jen Madden by email jen.madden@tpmechanical.com or phone 513-851-8881. For tips on how to prevent fire starters, holiday gift giving, and much more click here to continue reading. Our website hosts a page for employees to be able to access information regarding company benefits. If you happen to have questions or would like to access the information online click here to visit the benefits page. Please note you must be logged into the Employee pages to access this page. Congratulations estimating and sales for securing work totaling $9,090,108 and total man hours of 40,634. Wins below are reported for the month of October 2016.